BANGKOK, 21 March 2019 (NNT) - Prime Minister Prayut Chan-o-cha inspected a renovation project of Lumpini Park and viewed park goers exercising. 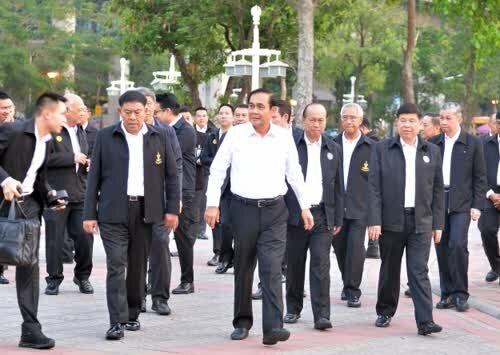 The premier arrived at Lumpini Park alongside his cabinet members at 6:30 a.m. as part of his following up on government projects in Bangkok. He inspected progress of landscaping work and renovation in Lumpini Park by the Bangkok Metropolitan Administration, as ordered by himself after meeting with park goers last year. He paid homage before the monument of King Rama VI, then meet with the general public participating in aerobic dance exercise in the park, expressing his aim to promote exercise among Thai people for better health. He observed the landscaping and renovation works in the park, including the planting of flowers, the replacement of umbrellas and tents and observed the Traditional Thai Food Center inside the park. Park goers voiced their feedback to the Prime Minister regarding parking spaces which should be increased to accommodate more users, while the premier suggested the BMA to increase the height of tents, place more umbrellas, and plant more trees, while park users and retailers in the park should help keep the area clean. He planted a yellow star tree along with members of partner networks, before proceeding to Benjakitti Park to observe the development of a forest park project. The ''fresh air '' is killing us . Also, he never talks about freedom. He just wants healthy serfs that do as told and don't talk back. Most politicos just want to be autocrats today. I hope you don’t mind if I steer this back to the topic. Its great to have a place to go exercise and running without getting run over by motorbikes and breathing in foul traffic exhaust. Plus it lets me burn off the calories from my pints the night previous. As a new visitor here I am very supportive of the desire to make it an even more beautiful experience. I'm not campaigning, I'm "inspecting a park". It desperately needs renovation; it might be an open space in a busy city but it looks poor and broken. The difference between Benjakitti is stark; so much nicer. The deafening music is always an issue too; I hope Mr Prayuth had his ear plugs in? Are there any monitor lizards left roaming freely? If you're new here you may be unaware of the fact fully grown monitors roamed all around the park. Relocating them somewhere else was one of those cases where the old Thailand evolved to a newer place, perhaps less interesting. Yes I have seen the big monitor lizards in the morning. Are they indigenous to BKK? A city the size and population of Bangkok needs at least three sized Lumpini Parks. So true. Many Thai cities have wonderful parks containing recreational and leisure areas. Sadly, many do not as they don't generate revenue/taxes. Pattaya for instance, is an ugly, commercial behemoth, begging for greenbelts and parks. Alas, the barstool crowd will chime in with the usual juvenile rhetoric as to the "real attractions" in that town. Back on topic, more parks and more oxygen generating trees are most welcomed.